Chairman of the House Financial Services Committee, has long been loaded for bear as far as financial regulations in general and the Consumer Financial Protection Bureau (CFPB) in particularly are concerned. So one would think given his long-standing antipathy that he’d be able to make at least a semi-plausible case against Dodd Frank, particularly given that it is such a behemoth of a bill that it isn’t particularly well crafted. In an an op-ed for the Wall Street Journal, Hensarling laid out his bill of particulars against the CFPB, which he called a “rogue agency”. In a new post at Credit Slips, Georgetown law professor Adam Levitin shows that the claims are demonstrably false. To the extent that there have been changes in bank behavior, they can’t be attributed to Dodd Frank. Drawing on Levitin’s post, we’ll put Hensarling’s claims in two categories: utterly inaccurate versus trumped up. Fewer free checking accounts. Hensarling made a claim that is sneaky: “The number of banks offering free checking has drastically declined,” to get readers to reach that conclusion. But even with the number of banks shrinking as consolidation continues (and the CFPB has squat to do with that), this assertion is bogus. None other than the American Association of Bankers shows the reverse, that the percentage of free checking accounts went up, from 53% of the total to 61%. Levitin points out that the CFPB can’t take credit for this, since it has done almost nada with respect to checking accounts, and the one area it did touch, remittances, is so small relative to checking account activity (many banks don’t even offer them) that it can’t have had an impact on overall pricing. Higher bank fees. This one is particularly rich, since the CFPB is now in charge of overseeing banks for overdraft abuses, and the overall fee reductions there have to be so large as to offset anything else Hensarling might be trying to pin on the agency. Or is Hensarling weirdly trying to assert that because banks can’t gouge consumers as much with their overdraft chicanery, they are raising the rack rate of other fees? The aggregate data refutes Hensarling’s claim. 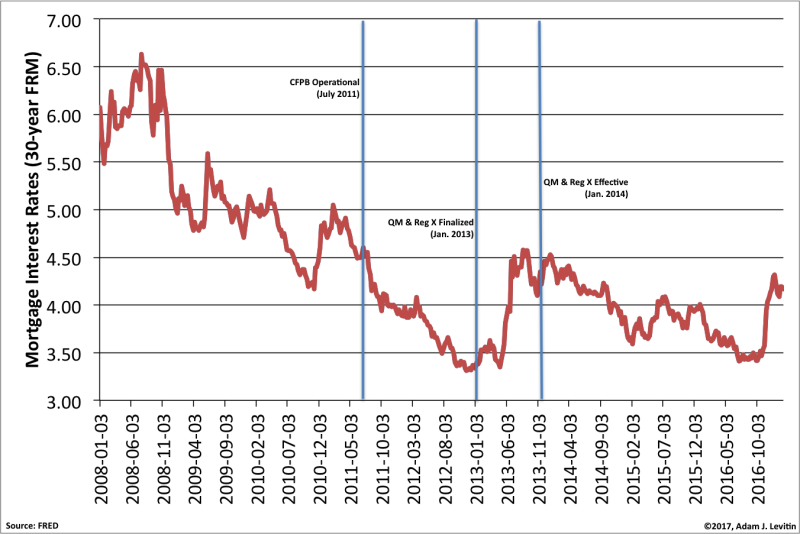 As you can see, aggregate fees on deposit accounts are almost flat since the CFPB has been in operation. Levitin does not mention that retail deposits have grown significantly over this period, so the amount of fees consumers are paying on a percentage basis has actually fallen. Other sources not only confirm Levitin’s high level take, but contrary to what Hensarling is trying to sell, credits the CFPB with lowering fees and squeezing bank profits. It’s not hard to discern that this is why Hensarling is at war with the agency, and not out of feigned concern for consumers. Noninterest income has also been flat, due to a series of postcrisis legislative initiatives that adversely affected fee-based revenue in deposit taking, credit cards, and payments. Ongoing scrutiny from the newly created Consumer Financial Protection Bureau has driven down pricing and ancillary revenues in consumer-facing businesses such as mortgages, deposit banking, credit cards, student lending, auto lending, and unsecured lending. So in other words, the impact of the CFPB and other reforms has been not just to curb fee growth but even reduce it. And notice this isn’t just account fees but mortgage charges and auto loans, which we’ll turn to now. With consumer protection outside the democratic process, consumers were harmed by a reduction in competition. 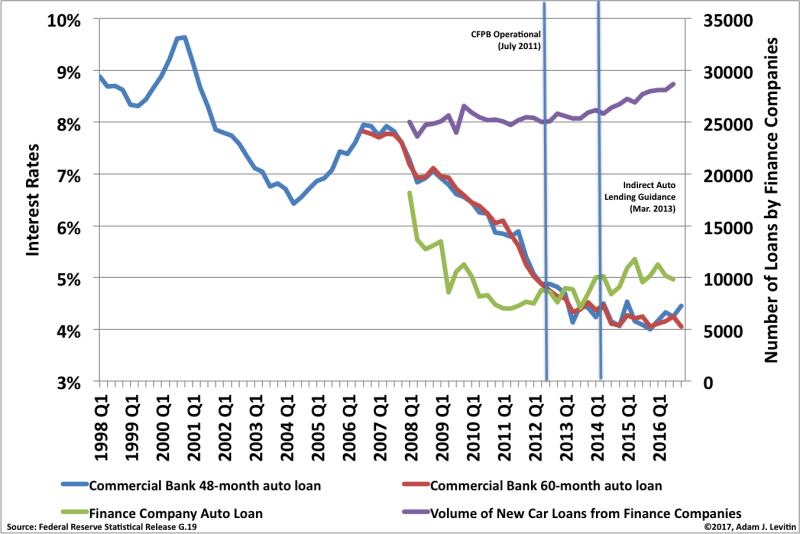 With fewer lenders serving fewer borrowers, fewer businesses employed fewer workers. This isn’t even coherent. The argument kinda sorta seems to be that the CFPB constrained consumer borrowing, which in turn reduced business opportunities. 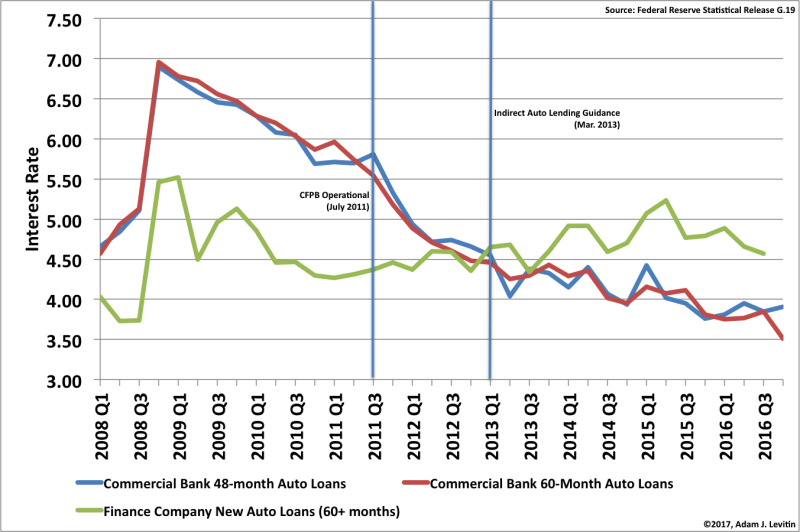 But any look at the data shows growth in consumer credit post crisis. (Levitin thinks Hensarling is trying to make the Trump argument, that regulation hurt lending to businesses, but as he points out, the CFPB has nothing to do with business lending). Yes, the number of banks has declined over the past several years, but it’s done so at the exact same steady rate of 316 banks per year that it has done for the last twenty-six years….There’s no evidence of the CFPB resulting in a material decline in the number of financial institutions, and indeed, it’s pretty hard to point to any particular CFPB regulation that would have driven anyone but a bad apple out of business. In any case, even if the number of lenders declined, there’s still plenty of lenders in the US and no shortage of lendable funds. Levitin bothered running a regression and got an R-squared of 95%. Mortgages became more expensive. Huh? 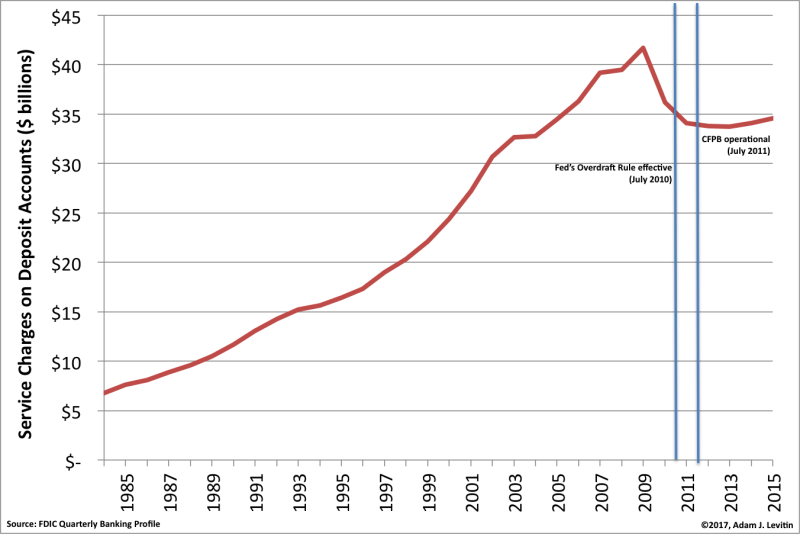 Again we have weasel-wording; “Mortgage originations…have become more expensive for many Americans.” How many is many? And given the typical compliant about post-crisis mortgage lending, that originators became restrictive. The big reason was that “private label,” meaning subprime, market, is just about totally dead, thanks to the originating side refusing to accept even modest reforms while investors won’t touch the stuff without them. The lower-credit quality mortgages typically have more fees and costs than the higher credit quality ones. While Dodd Frank did impose a requirement that banks be sure that borrowers are likely to be able to repay their mortgages (what a concept! ), the much bigger driver of increased origination hassle is meeting new Fannie Mae representations and warranties, plus having to cover the cost of default servicing. The CFPB has nothing to do with that. So harbor no illusions. The reason the CFPB is in the Republican’s crosshairs has absolutely nothing to do with the impact on consumers. It’s due to the fact that the agency has managed to curb some very lucrative bank misconduct and was en route to stymieing the use of mandatory arbitration agreements. It’s now bizarrely accepted in the Beltway that major businesses should have the right to extract rents of all sorts. Trump, in attacking Dodd Frank’s tame reforms, is on board with that program. This entry was posted in Banking industry, Credit cards, Credit markets, Economic fundamentals, Politics, Regulations and regulators on February 16, 2017 by Yves Smith. truth to power. thanks and good luck. The more its opponents try to gut the CFPB, the more apparent is the need for a fearless independent consumer financial regulatory authority. My major criticism of the agency is that it’s so far proceeded far too cautiously on many issues. Just one example: I wish the CFPB had issued the mandatory arbitration rule much more quickly, and crossed all necessary procedural Ts and dotted the Is– rather than faffing around with studies for far too long. Then perhaps at least a new rule would be in place, egregious mandatory arbitration procedures would have been reined in, and the rule-making wouldn’t be subject to CRA review. Instead, we’re still waiting for a final rule to be issued.